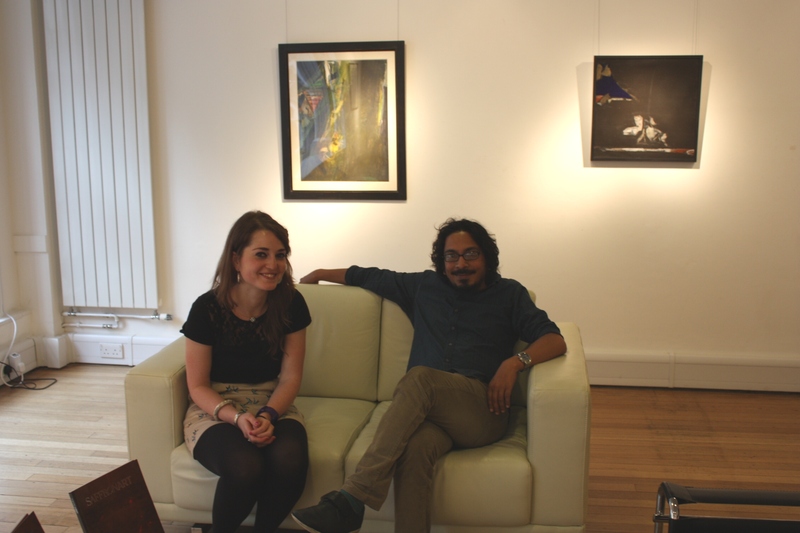 London: Last week I had the pleasure of meeting Sarnath Banerjee at our London gallery. The artist, living at the moment in Berlin, was in London for a talk about his latest work for Frieze Project East. 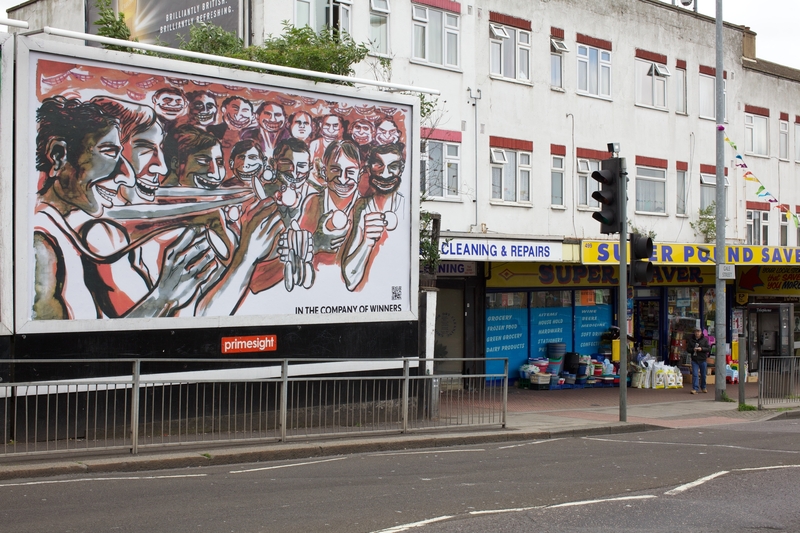 Sarnath, along with five other international artists, was commissioned to create site-specific works for the Olympic Host Boroughs in East London: Barking and Dagenham, Greenwich, Hackney, Newham, Tower Hamlets and WalthamForest. This project was commissioned by the London 2012 Festival and CREATE, and curated by Sarah McCrory of the Frieze Foundation. 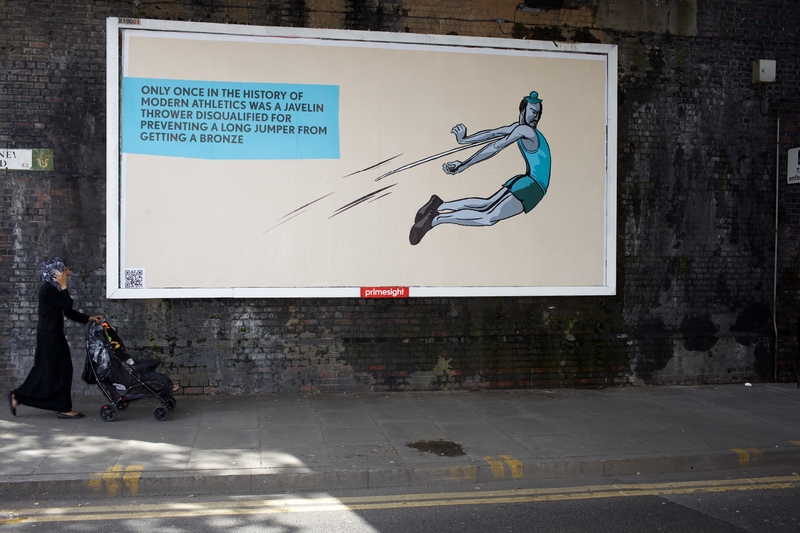 Sarnath’s work “Gallery of losers (non-performers, almost-winners, under-achievers, almost-made-its)” consisting of 48 billboards, posters in local newspapers, and hoardings in East London, narrates the shared history of competitive sport from a different prospective. Going against the grain of most other Olympics-related advertising which solely emphasized winners, the artist decided to focus attention on the losers, the people who almost made it but didn’t quite succeed. Q: How did this commission come about? A: Sarah McCrory a couple of years ago saw my work for the first time at Frame, Frieze, and she liked it. She thought my work using text and image had a narrative possibility which may have affected a large community and was suitable for a public art project. Also my connection with East London made me a potential candidate. She asked me to present an idea for the Olympics and I proposed a “gallery of losers”, Barwa Khiladi (12th man) who is always ready but the opportunity never comes. It got accepted. Q: Why did you decide to focus on “the losers” for this project? A: I think there is a certain dignity about losing, and coming from India we had to hold on a lot to that dignity. We had few things to celebrate about: sports, economy etc., and the few wins were a matter of great celebration, but then we had great losses which we dealt with dignity and humour. Lots of modern India is based on this self-reflective humour and self-criticism. However, now a self-congratulatory middle-class developed and the society became winning oriented and the system started making us look like fools. And London on occasion of the Olympics has become a self-congratulatory place. I find winning and winners vulgar. So using my expertise in advertising I created a campaign about losing to humanize the Olympics. The characters are lovable, very human. They are all parts of me, they are based on myself rather than sporty people. They are part of a photo-album of non-achievers. I have a boxer who is always thinking of dodging punches, a pole -vaulter who, just before a jump, realizes that perhaps he has chosen the wrong sport, a judoka who learned the sport through correspondence, a high- jumper, who only eats light food, has light thoughts and reads light literature because high-jump is all about levity. I also have a race-walker whose mind moves steadily towards the finishing line but her legs don’t keep up, a ping pong player who is suddenly aware of the eerie silence of the indoor stadium and tries to remember how one spells the word ‘eerie’. Some stories are dark like the one of a javelin thrower who accidentally hits a long jumper thus disqualifying himself and destroying the medal chances of the latter, and a fencer who is shaking because three other fencers are looking at her. Q: Can the concept of losing and losers be expanded to a broader context? A: Surely it can. This is not about athletes at all. It’s about the people who are not on the list, people who cannot make it. It’s about myself, it’s about loss. I met the best losers in the world and I don’t win myself, but I don’t care about winning. There is no importance in winning, it is valueless. Q: Do you think words are more powerful than images? A: Words and images are equally important. I create events using words and images. They create meaning together. They manage to create an atmosphere in your head, a kind of shamanistic process. When text and image work together, they can really make you feel the situation and make you see things. As T.S. Eliot said “I will show you fear with a handful of dust”. Q: You are one of the first Indian graphic narrators. Do you think it was harder for you to be understood and achieve success? A: Yes, definitely. Pioneers are the ones who make the roads. They have the hardest job, people expect the top from them. At the beginning I felt misunderstood, people in India thought graphic narratives were only for children. Now the new generation is more interested in it. It has become a fashion statement. This is one of the reasons why I momentarily moved out from it and started experimenting new media. In fact my next project is about the concept of Un-Heimlich (the German word for uncanny and un-homely) and I will use a different medium for this. A: Ummm…the purpose of my art…I think everyone needs to find a place where he doesn’t feel rejected since the world provides us with every day rejections. So, I feel art is this place for me. Also creating a work helps me understanding things, it is a medium to reflect and record important events. Art opens up different ways of approaching knowledge and it helps to transcend from everyday life. Also, vulnerability creates art. Most of my works are homage to people I met, or people I think I know in my imaginary world. I transplant my imaginary universe into these people and then into my work. My art is very people oriented. It can also be considered an inner journey of spirituality because I’m trying to make sense of the world and I’m trying to express my anxiety about losing. Q: Do you consider your art to be “typically Indian”? Is your work influenced by any other artist or school? A: In this time and age there cannot be anything typically Indian. We are constantly surrounded by international things. However, I do think and work locally. International art projects don’t work, they tend to fall into very simple stereotypes. Also, you aren’t truly international unless you have a very deep sense of the local. To answer the second part of your question, I’m continuously inspired by outside stimuli, not necessarily art related. It can be science, literature (E.T. Hoffmann) etc. They change every time depending on my current preoccupation. Recently I was reading a lot about the Moscow conceptualists, especially Ilya Kabakov. At the end of the conversation with Sarnath I’ve learnt an important lesson: losing is not an absolute condition and it’s not necessarily that bad..